Fourth Row Center: Film Writings by Jason Bailey: In Theaters: "The City of Your Final Destination"
There was a time when Merchant-Ivory productions pretty much personified the notion of the art film. In the late 1980s and early 1990s, their elegant, intellectual dramas served as an alternative to the noise of the multiplex; their films were independently financed (though often picked up for distribution by major players), and their biggest successes—pictures like Howards End and The Remains of the Day--met with rapturous reviews, respectable box office, and Oscar glory. In many ways, they were the chairmen of the board of alternative cinema. And then Pulp Fiction happened. Suddenly, independent film got a shot of adrenaline (literally, in one of its many iconic sequences); audiences and distributors realized that arthouse cinema didn’t have to be dry and stoic, and seemingly overnight, Merchant-Ivory were relics of a bygone era. Their subsequent output has been, to say the least, unevenly received, in critical or financial terms. 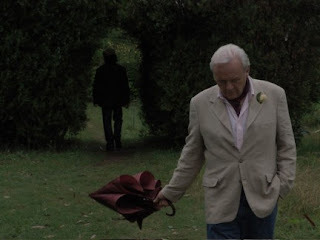 Producer Ismail Merchant died in 2005, but the production company still bears his name; director James Ivory and screenwriter Ruth Prawer Jhaba (who penned many of their best-known pictures) collaborate for the first time since his passing with The City of Your Final Destination, based on Peter Cameron’s 2002 novel. It also marks the return of their frequent 1990s leading man Anthony Hopkins, but alas, they can’t make lightning strike again. It’s a well-made film, but not a terribly engaging one. The troubles start with the less-than-compelling story. Omar (Omar Metwally) is a young academic who hopes to write a biography of a celebrated but reclusive writer, Jules Gund. Since the writer’s suicide, his estate in Uruguay has continued to be inhabited by his brother (Hopkins), his wife (Laura Linney), and his mistress (Charlotte Gainsbourg). As the film begins, they refuse to authorize the biography, but at the urging of his girlfriend (Alexandra Maria Lara), he travels to Uganda, hoping to pursuade them in person to sign off on the book. That, I’m afraid, is the entire story—a guy trying to get a family to authorize a biography. Doesn’t exactly sing, does it? What’s worse, Ivory’s pacing is impossible; the thin story is stretched out to an overlong 118 minutes, and has become quite the slog by the end of them. It’s elegant and handsomely composed, yes, and it’s a lovely film to look at (the location work is beautiful). But the dialogue is stilted and, try as they might, the filmmakers can’t make the central situation interesting. Hopkins helps. He turns in a high-spirited, good-natured performance as the one member of the mourning trio who thinks the book is a good idea; informed that it’s two to one against him, he cheerily replies, “Well, I refuse to be guided by anything as stupid as democracy.” He owns the picture—it comes to life whenever he’s on screen. Linney’s also doing some good work as the jilted but stubborn wife, a once-gifted painter who now sequesters herself and turns out counterfeits of other artists’ work. There’s a nice snap to her performance, and a touch of sadness too (particularly when she admits, of her late husband, “I wasn’t good enough to paint him”). Gainsbourg, on the other hand, can’t do much with her thinly drain waif, and Metwally is an even bigger problem. He’s a dud, a blank slate, a pretty face without much happening behind it. Of his book, he insists to Linney that “everything depends on it,” but it’s not convincing—there’s nothing in that reading, or any of his others, to suggest much of anything depends on anything. There’s no urgency or fire about him, and it makes the film even more inert. His brief, underdeveloped romance with Gainsbourg couldn’t be less interesting (Ivory’s just marking time here), and when he lands on the hospital, the girlfriend hustles into town and takes over as protagonist. But she’s dull as well (her line readings are particularly wooden), and we end up checking our watches through much of the third act—particularly the overwrought, melodramatic climax. It’s hard to get too worked up over The City of Your Final Destination; it’s not a bad film in any obvious, aesthetic sense. Ivory has been doing this too long to make an incompetent film. But an incompetent film might have more to draw us in—many a passionate filmmaker has made a clumsy, clunky picture that still engages the viewer and sticks in the memory. Ivory’s films are slick and smooth, but that also means there are no edges to them. There’s not much in the way of blood running through this one, as immaculately prepared and handsomely mounted as it is—it’s all very pretty, and pretty boring. "The City of Your Final Destination" opens Friday, April 16th in limited release.